The reason for this blog is to inform. Inform about food, farming and land. I aim to take some of the romance out, and put the dirt and sweat, back in. I live with a farmer. Paul Wirtz has been growing a diversified cropping of produce, including a full salad mix, for 24 years in Sonoma, California. He’s always farmed following organic standards on leased land. For the past 10 years Paul signed on as “production manager” for Oak Hill Farm. Now, we are farming on almost 10 leased acres, land Paul has been working for almost 20 years. I’ve known him for 10 years, lived with him for 9 and learned about what it takes to have “farm” in your blood. The posts will mostly come from me. Paul just doesn’t have time to do this. In case of technical details, I will run words by him before posting. Otherwise, you’ll read my impressions and observations. And who am I? What are the economics of farming? in some day on the motorcycle to say hi. Stay in touch broseph. Yeh, good to finally touch base. What is a broseph? I’m older and out of touch with some stuff. It’s great that you are so into motorcycles. I got on one about 5 years ago and it felt so dangerous that I decided not to buy it. We change, but as long as we’re upright we’ll keep trying new stuff. I’m so glad that you are ok and that your family is in tact. one who is considered a brother. Great local food here from wi and mi!!! hey Lena, how did you happen upon our site? Nice of you to respond. I wonder how you are doing in Chicago. Of course it’s like forever ago when I lived there but from time to time I meet someone from Chicago and I’m surprised how much I remember about my time there. The world is surely different now huh? Robin is a more distant memory than Chicago even. After many years of close friendship with Sarkis, he also wants nothing to do with me. I can’t figure it out really but maybe it’s not to be figured out. I love my life here. I work hard, sleep hard, do Tai Chi, live day to day mostly. How about you? Are you doing art? I remember painting your parents dining room and you brother whos name escapes me. I just heard that your farm stand is open on Saturdays 9-1. Where is it?? The farm stand is at the farm site; 19655 Arnold Drive just southwest of the town of Sonoma. We had a great first day and expect it to grow. Thanks for asking. Yes, Casey’s film, The Organic Life, is about Austin her beau who works here, at Paul’s Produce. 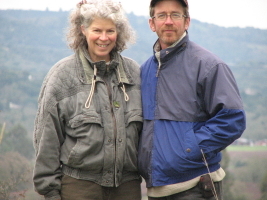 The film is a glimpse into their lives and their relationship with farming. I couldn’t agree with you more, this is important work. That’s why I’m here! please add more information to your site on how citizens/neighbors can support you. do you have subscription delivery service? can we visit to help you harvest? do you have an abundance of seasonal crops that you are unable to find a market? Thank you for your comment. We are so well supported by our Farmers’ Market customers, restaurants and winter CSA members that it hasn’t occurred to me that some might need more information. We do have a small winter-only, CSA. No delivery, members pick up here. E-mail if you want more information than you can gather through the above tabs or to sign up. We do not allow the public to help with harvests. And thankfully, we are selling almost all we grow. We sell at two farmers’ markets in Sonoma and have a summer stand, open on Saturday mornings, at the farm. I write for Kentucky Gardener Magazine and came across your photos of Brussels Sprouts in looking for pics for a last minute piece they requested I write. Would you be willing to grant permission for pics of your Brussels sprouts harvest to be featured in the next issue, with proper credit to you and your blog of course! Sure! Happy to share. Thanks for your kind words. Would you send us a copy? I may need to get full file size of the pics I would like to feature. Many thanks!